Ghost hunters are taking part in a scientific experiment at what is claimed to be one of the UK's most haunted locations. Mary King's Close is a warren of underground streets in Edinburgh, sealed off from the outside world more than two centuries ago. About 200 volunteers will take part in research led by Prof Richard Wiseman of the University of Hertfordshire. Prof Wiseman believes ghosts are literally all in the mind. The psychologist has carried out research suggesting people react to environmental cues, such as subtle drafts, and, in particular, visual factors, like low lighting. A strange feature of Mary King's Close is striking similarities between many of the reports of phenomena experienced there. Its most famous ghost is Annie, a playful child spirit who has been known to tug at the skirts of female visitors. The volunteers will be asked to walk in small groups through the streets and the remains of their old houses, and report anything unusual. Previous visitors are said to have experienced apparitions, phantom footsteps, eerie sensations and feelings of sickness. Hidden temperature and humidity sensors will monitor "cold spots" - commonly found in supposedly haunted locations - while other instruments will record magnetic activity and low frequency sound waves. Prof Wiseman said: "One of the things I'm most interested in is the idea that certain rooms are perceived as having personalities, which might elicit stereotypes of ghosts. "We'll be asking volunteers not only whether they've experienced a ghost, but what kind of ghost it is. "We've also made photofits of mock ghosts, and ones that have been reported, and we'll be showing them to volunteers in different rooms. "The idea is to see which ghosts people think are most likely to be seen in a particular room, and whether they coincide with genuine reports." Prof Wiseman suspects that feelings of sickness and uneasiness could be caused by "infrasound" - low frequency sound waves that might be generated by traffic rumbling overhead. Mary King's Close, off the Royal Mile, was bricked up in the 17th Century and was only reopened in 2003. 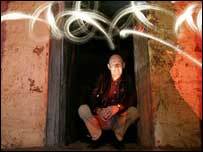 The "ghost experiment" is part of a 10-day Mary King's Close Ghost Festival. Prof Wiseman hopes to announce initial results from the investigation towards the end of the festival on 22 May.